NASA astronaut Karen Nyberg displays the star-theme quilt block she created aboard the International Space Station. A crafty astronaut has sewn a starry-quilt block aboard the space station, and is inviting others to join her in doing the same. Karen Nyberg, who is in the final weeks of her five month stay on the International Space Station, recently revealed her handiwork a 9-by-9-inch (23-by-23-cm) red, white and blue square that she stitched together to create what may very well be the first example of quilting in space. "But it was made in space," she stated. Nyberg, who is serving as a flight engineer on the station, has used her limited free time in orbit to experiment with her hobby of sewing. In September, Nyberg showed off a small stuffed toy dinosaur she made for her 3-year-old son by stitching together the fabric lining scraps from Russian space food containers. On Thursday, in addition to NASA announcing her exploits in quilting, Nyberg shared a photo of a small Texas state flag she "simply made" from red, white and blue fabric that she cut from t-shirts she had worn during her stay on the orbiting outpost. The flag, she said, is a memento for her husband, fellow astronaut Doug Hurley. "We met in Texas, got married in Texas and had our son in Texas," Nyberg wrote in her caption for the image of the flag on the pinboard-style photo-sharing website Pinterest. Like the dinosaur toy and the state banner, Nyberg plans to bring her star-themed quilt square back to Earth when she departs the space station on Nov. 10. Unlike the gifts for her family though, Nyberg has continuing intentions for the fabric block. "I will be bringing this block back with me when I return to Earth and I'm inviting all of you to make your own star-themed quilt blocks," Nyberg said. "We will be combining them with my block to create a quilt for next year's 40th anniversary International Quilt Festival in Houston, where I hope to make a special appearance." In trying her hand at sewing in space, Nyberg learned a lesson about crafting in orbit. "I can say one thing with certainty — it's tricky," she said. Nyberg added that it took her a long time, longer than one might expect, to stitch the star-themed square. On Earth, she was more accustomed to sewing with a machine than by hand, she said, but that was not the only difficulty she encountered while trying to create her quilt. Nyberg said that it was important to keep things organized ("ziplock bags come in very handy") and velcro was useful for keeping her tools (scissors, needles, spools of thread) in place when not being used, but microgravity presented a problem other than just her supplies floating away. "You can't lay things down and measure," she explained. "I found myself taping the fabric to a surface, trying to lay it out." Even using a cardboard square to trace a pattern onto the fabric didn't quite work out. "It becomes very tricky when the pieces do not have the quarter-inch seam allowance that you really had hoped for. It's less than perfect," Nyberg remarked. But, she said, the time and trouble was worth it. "It will be neat to have a quilt block I can say was actually sewn during my time in space." ISS Expedition 37 flight engineer Karen Nyberg sewed this Texas flag from fabric she cut from t-shirts she wore in space. Nyberg is now inviting crafters on Earth to create their own star-themed quilt blocks to help celebrate her mission and passion for the quilting arts. In cooperation with the International Quilt Festival, Nyberg and NASA have begun a "Star Block Challenge." Quilters are invited to create their own star-themed square by Aug. 1, 2014. "The theme should be any variation on a star," the festival organizers' noted of the desired squares. "We welcome all types — traditional, modern, and artsy variations." The 9.5-inch (24 cm) squares will be sewn together and combined with Nyberg's made-in-space block to create a quilt that will be displayed at next year's gathering. To help get the word out, NASA is exhibiting at this year's festival, which started on Thursday and runs through the weekend at the Brown Convention Center in Houston. In addition to distributing information about the challenge, the agency is displaying sewn samples from spacesuits and parachutes, a cargo transfer bag and other softgoods from the Johnson Space Center. For more information about the Star Block Challenge, see the International Quilt Festival's website at www.quilts.com. 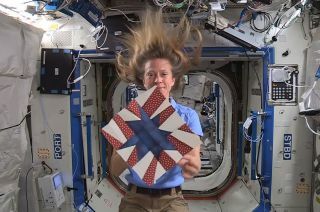 Click through to collectSPACE.com to watch video of astronaut Karen Nyberg explaining how she quilts in space.